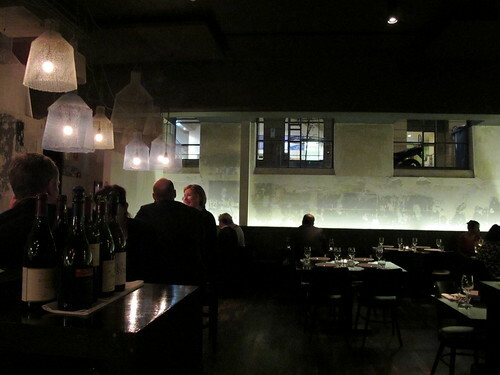 It was actually several weeks ago that I went along to Coda with Em for dinner, but I wanted to write about the restaurant on the blog in anticipation of the Gourmet Traveller Roy Choi dinner they'll be hosting as part of the MFWF. Having read so much about Choi's Korean/Mexican taco truck mash-up that took LA by storm, I'm really looking forward to trying his food. 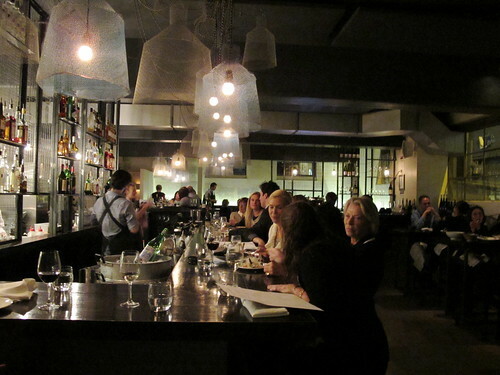 Occupying the laneway bunker site formerly known as modern Greek restaurant Mini, Coda has been around for just under two years. 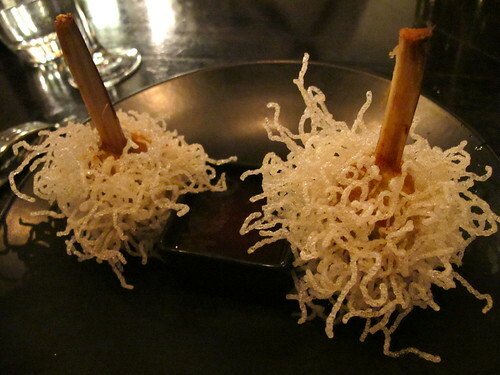 Chef Adam D'Sylva's menu sticks mostly to mod-Asian, with a few Euro bistro dishes thrown in. The back half of the room is the restaurant that takes reservations, but there's also lots of bar seating for walk ins. 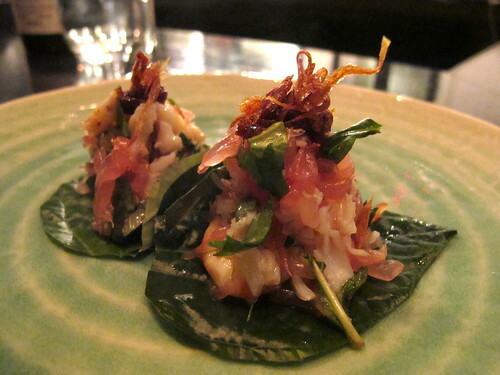 We decided to share several of the smaller dishes, and started with a couple of tasty betel leaves heaped with spanner crab, galangal, roasted chilli and lime ($5.80 each). The sugar cane prawns ($7 each) with sweet chilli sauce look brilliant, coated in fried noodle that gave a pleasing crunch when bitten into. We held them by their sugar cane handles and bit into them like they were toffee apples wearing afro wigs. 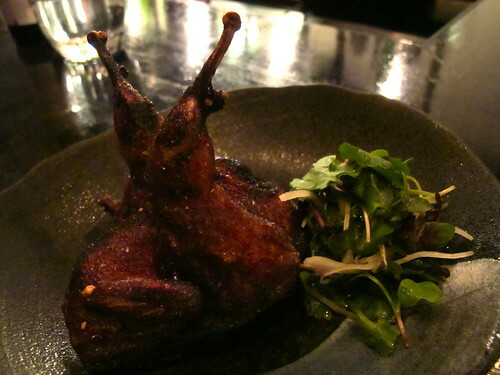 Also fried was the blackened quail ($7), made sticky by its marinade of soy, mirin and sake and served with a refreshing little daikon and shiso salad. 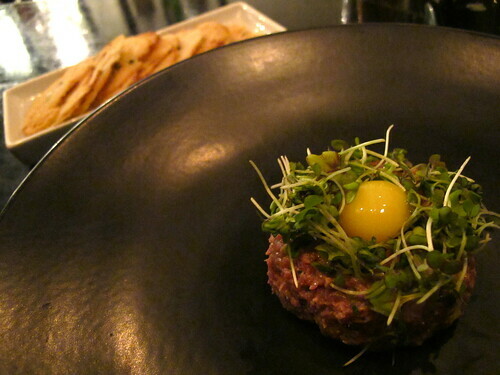 I'd been to Coda's bar on boozy nights out before, and each time I'd eyed the steak tartare on the menu longingly. It ain't cheap at $24 but it's a generous serve and comes with a quail egg, mustard cress and little melba toasts embedded with capers. 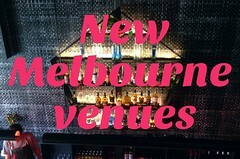 The fitout is unashamedly industrial Melbourne chic - lots of distressed black, exposed concrete and metal. I do love those mesh lampshades. 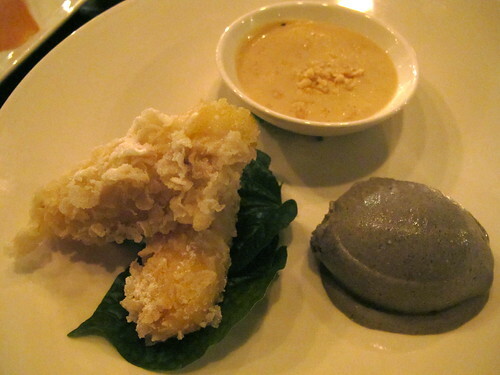 My favourite dish of the night was dessert: monkey banana fritters with salted peanut coconut caramel and black sesame ice cream ($15). 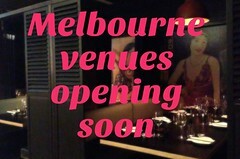 Long may the current trend of salty tropical flavours in Melbourne desserts continue! Black sesame ice cream is invariably an unappetising concrete colour, but this one was deliciously smooth. Excellent, non-greasy batter on the bananas too. So yes, we had a great feed at Coda and I'd definitely recommend popping into the bar for munchies when you're laneway crawling. Just be aware that getting a table for more than a few can be tricky: in the (slightly problematic) words of Coda's website, "Groups of 2’s and 3’s in the bar are easy to find a space for, if your coming in with a group of four or more slip us a fifty at the door and you might have a lot more luck!" 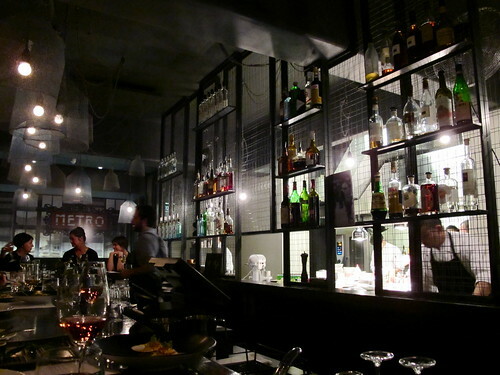 Huzzah - glad you finally blogged this, was a delicious night and your photos look great too! Looks like a keeper! Long may the tradition of salty tropical flavours in desserts continue- all around the world. Yum. I've long had a love affair with Coda. The food is so damn tasty. Coda has been one of my top listers for almost a year now, waiting for my flight from LAX to Melb, and finally I am here. So happy to read your post. 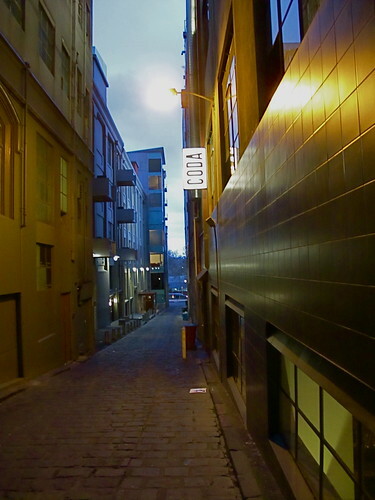 I am still pretty freshly new to the city, but soon enough ill make my way to Coda.